Recently a client told me that de-cluttering and clearing her home was like seeing the sunshine come through the clouds. If you have a home that is covered in clutter in the form of piles of paper, boxes of things, overflowing bags and shelves your home feels like a dark, cloudy day. There is a beautiful, charming and lovely home underneath, you just have to take a few minutes a day to remove the clutter and begin to see the light shine. You begin to see the possibility of the home that was always there, of the space that you have been craving and searching for. You are peeling back the dark layers to reveal a sparkling space. I have noticed through work with clients and through my own home clearing process and continual care of my home that layer after layer of clouds start to go away, and the light of new ways of life and new ways of being start to shine through. It is not just about our physical space, it is about the mental clutter that the physical items create as well. Here are a few examples I would like to share with you about my personal experience. One super fun result of our recent de-cluttering of our entire home has been that we have started to thin out a large collection of board games. This is a process that will take some time, but in the meantime we can actually see the games that remain on the shelves, pick them out and play 1-3 games a week. My 10 year old son has really taken a liking to some games that we hadn’t played in years. It’s been fun and such a great evening activity for the three of us! I look forward to playing more games together. Another thing that I have noticed as I have de-cluttered is that I have more time. As a result of going through my memory boxes and wondering why we may be afraid of the present moment and thus are spending too much time on our phones and other devices, I have decided to spend very little time on my phone. I was spending upwards of 4-5 hours on it every day. I have noticed in the days following the choice to be on my phone as little as possible, I have gained those 4-5 hours in my day back and then some. I have had more time to spend with my family relaxing, more time to read books, meditate, write in a journal, think about ideas, draw, explore art projects and more. This is a huge revelation to me. I think that I was losing so much time every day not only when I was on my phone but because of the after-effects of constantly checking email and social media. I felt like my brain was really scrambled from information overload. I felt like I was spinning around thinking that I had to do 10 things at a time when really I only needed to do a few things each day. I feel so at home now just in the present moment, just being. It is so amazingly refreshing. Recently we finished getting all of our tax paperwork ready for our accountant. It was a relatively quick process and as a result of my de-cluttering I found an important document we needed for our taxes. Also, after we got our packet ready to drop off at the accountant’s office I was able to find exactly where to file the remaining papers since I only have 1 file drawer to keep papers in. I no longer wonder if the papers are in the office or garage. This is fantastic peace of mind! Why are you hanging on to stuff that stresses you? Let’s get curious for a moment. (Just like the cat in the picture above, looking through the boxes). Do you feel stressed in your own home? Do you have piles and boxes of things stored away or in plain sight that leave you wondering what to do? In this post we are here together to answer the question: Why are we hanging on to stuff that stresses us? Here I’m going to explore three reasons why we may be hanging on to all of that stuff and how we can let those reasons go. We all hang on to things because of the thought “What if?” For example, we hang on to a very specific piece of cooking equipment because we think “What if I decide to make _________ for a party.” We probably haven’t used it for many years, or ever, but that “what if” lurks around as if it were speaking to us every time we look at or think of that item. We may keep a piece of clothing because “What if I decide to go on a trip and I need to wear ____________.” Even though we really don’t like the color, or we bought it on sale because of the “what if.” What if takes over our shelves, drawers, cabinets and closets. It takes up residents in our thoughts. Every time we try to de-clutter or let go, the “what if” is there saying “no” to us. The “what if” can come up also if it’s an item that was a gift. What think “What if __________ comes to my house and wonders where that item is?” Chances are the person will be thinking more about enjoying time with you than if you kept that item. “What if” is like a sneaky gremlin stopping us from getting rid of the physical items causing us stress. It’s always blocking us from letting go. You can stand up to “what if” by powerfully saying “I’m living in the present moment now. What if cannot have a hold on me. I will make choices based on if this item is really serving me right now.” That will make the “what if’s” voice much quieter, and eventually “what if” will retreat and go away. If you have boxes and bags full of old graduation programs, certificates, journals, letters and more, those things can cause you to live in the past. I believe you can keep part of your past and still live in the now, but it is important to choose carefully the items that bring you joy now when you look at them rather than those that cause you to relive some past pain. Items that are from an old relationship or a friendship that is no longer part of your present moment are ones that are important to let go of. Letting go of those items can open up your possibility space in the present moment and you will feel much lighter for getting rid of them. Sometimes we can even hang on to things that we think we will do in the future, and that keeps us from enjoying our present moment and the things that we choose to do now. It can cause us to feel like a failure even before we have started anything. Those are another type of little gremlin called “Someday I will.” These are like the weights, yoga mats and exercise DVDs that are gathering dust in the garage while you have found a way to exercise that you enjoy right now. Those items say to you every time you pass by them “Someday I will….and then….” They seem to taunt you and cause you to think twice about the choice you have made in the present moment. Who needs those when we can feel good about who we are and the choices we have made right now? For example, I went through a phase when I thought that I wanted to start a weight-lifting routine again. I put together a weight set, bought books, etc. Then, I realized that I enjoyed working out on the elliptical that we already had set up in our family room first thing in the mornings much more. It was exercise that I knew I would stick to as a 5 day a week habit. It was something that I could be in the present moment with. So, I am letting go of the equipment and books and applauding myself for finding what’s right for me, not something I thought I ought to do. The “someday I will” gremlin will go away when we are able to face those “future” items and let them go with grace. What if we lived in the now? 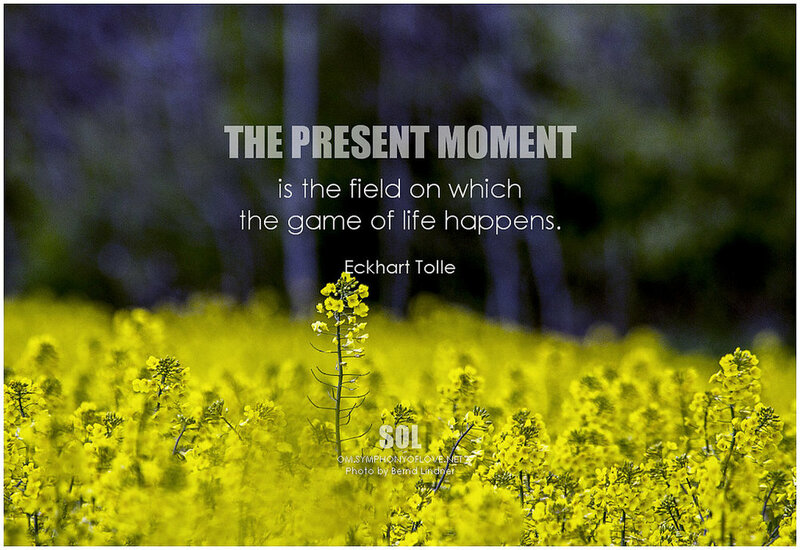 If we live in the now we can just ask “Is this item serving me now?” Items can serve us now by being useful in our present moment lives, or being something that gives us joy right now as we display it or look at it.